A stunningly beautiful round brilliant cut diamond, surrounded by a pave halo. This centre stone is mounted in a bezel or rubover setting. The result is a strong outline separating the centre stone from its decorative surrounds. The wirework in the basket add to this magnificent piece. This piece is also beautiful set with an emerald, ruby, or sapphire centre. 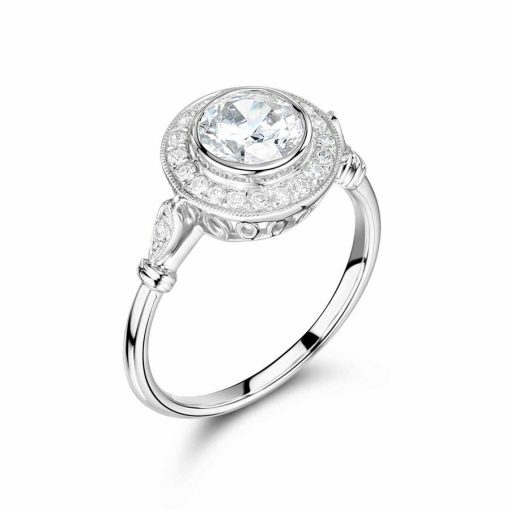 Do you love this style but want to customise it, making a truly unique ring just for you? We are delighted to meet with you and discuss your ideas. Our offices are based in Dublin and London. Call today to book your consultation.